Sewer inspections are important because any problems with the main sewer line are the financial responsibility of the owner. If there are problems with the sewer line that routine sewer cleaning won’t solve, the repairs will be expensive. No age of home is immune to sewer problems. While it’s unlikely, even new homes can have problems with the main building drain. As you might imagine, the potential for problems increases with the age of the home. If you’re buying a new home, you probably don’t need to spend your money on a sewer scan. If you’re buying a century-old home, it’s smart to have a sewer scan done. There is no clear dividing line between homes that should and shouldn’t have a sewer scan performed. * The decision will ultimately come down to the new home buyer’s tolerance for risk. 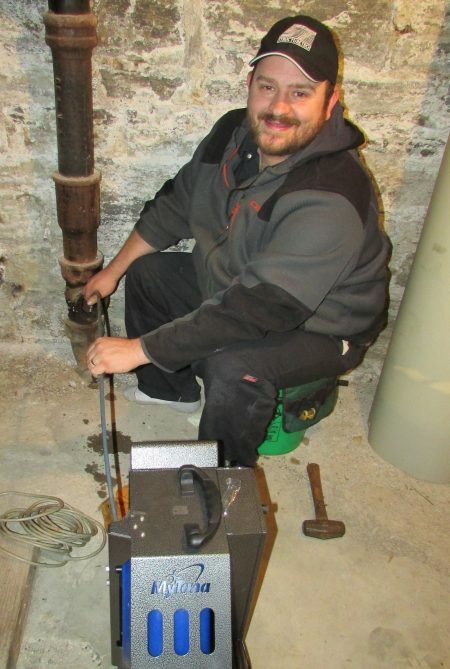 We have partnered with Joseph Whitters, a second-generation sewer guy, to provide this service. At the age of 8, Joseph began working every other weekend and every summer helping his dad clean sewers and drains. He legally became a Drain Tech at the age of 16 in 1996, and eventually took over his father’s business in 2004. Joseph is certainly one of the most knowledgeable sewer and drain guys in Minnesota, and he is very good at explaining what he finds. He’s undoubtedly the #1 guy in the #2 industry. We’re proud to have made this partnership. Every sewer scan includes a written report of our findings, as well as a digital video file of the scope. The fee for a sewer scan is $175 if performed at the same time as the home inspection. Sewer inspections are scheduled through our office at the same time the home inspection is scheduled. The video clip below shows a real sewer inspection on a sewer that is in good shape.